By Imelda in Culture. Updated on August 3, 2018 . The word ‘selfie’ is so popular these days that there’s even songs about it. After all, it was declared by Oxford Dictionaries as their International Word of the Year in 2013. Whether you love them or hate them, selfies are probably gonna be around for awhile. There are even plenty of selfies that are making it into the news headlines for one reason or another. Here we’ve gathered 15 selfies that have made the news headline. From ones featuring celebrities to selfies that have managed to save lives, each one has a lesson that we can learn from. 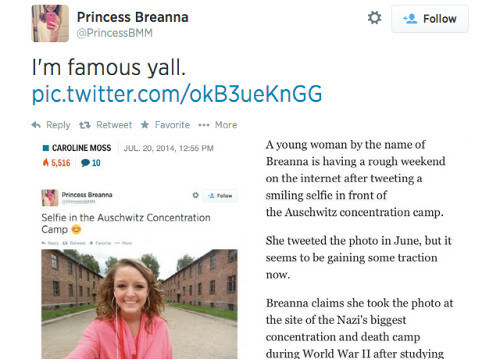 Breanna Mitchell posted a selfie of herself smiling in front of the Auschwitz concentration camp on Twitter in June, but suddenly she woke up early morning on July 20 to find hate retweets and mentions on her notification, thus resulting in #auschwitzselfie trending. Claiming that she felt glad to be at the place since it was her desire to be there with her late father since childhood; she battled against the haters and said she won’t regret posting the selfie on social media. Many people felt that it was distasteful but judging by her reaction at her fame, she was clearly enjoying the limelight. 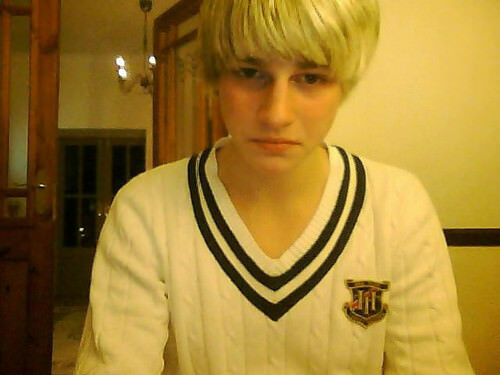 Danny Bowman, 19, left school and never went out of his house for 6 months in an attempt to take the best selfie of himself. He spent 10 hours taking up to 200 selfies per day using his iPhone and even became aggressive when his parents tried to stop him. When he reached a point where he knew he was overly addicted, he tried to commit suicide by overdosing, but fortunately was rescued by his mum. Perhaps we should all bear in mind that a selfie addiction could be an indicator of something else. This priceless selfie montage tells us about a young girl who is battling with a hair-pulling disorder. Taking a photo of herself everyday for six years is what she felt right in expressing how the sickness had affected her life. Rebecca Brown from Essex, who is 21 this year, had been affected by trichotillomania – a mental disorder which gives her the compulsive urge to pull her hair out, leading to hair loss and depression. She claimed that she has been using social media to cope with her depression, specifically Youtube since 2007. She has almost 200,000 subscribers who are inspired by her, sending Brown letters as their way to express their feelings. These days when you meet a celebrity, your first instinct is to probably take a selfie with them. But this young man did not just manage one celebrity but two. With the caption “Chillin with my hommies,” you know that this is as epic as it gets. With both Paul McCartney and Warren Buffett, how could it not be? 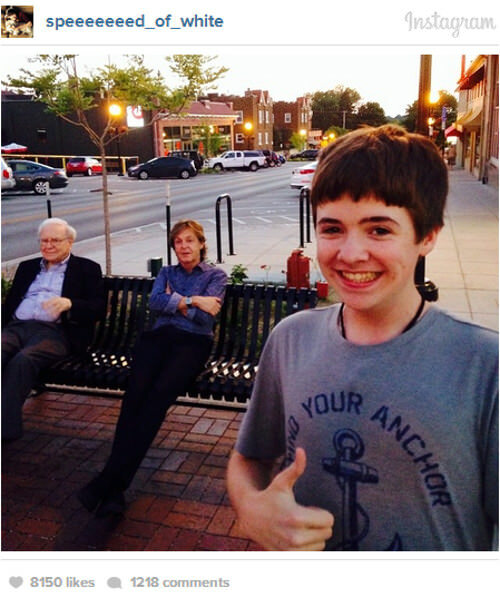 Tom White knew that he’d be able to make fans of Paul McCartney and Warren Buffett jealous when he uploaded this selfie on Instagram. He did of course and hey, he even made it in the news headline. Most people have the smarts not to upload anything incriminating up on Facebook. That’s not the case for this particular lady. 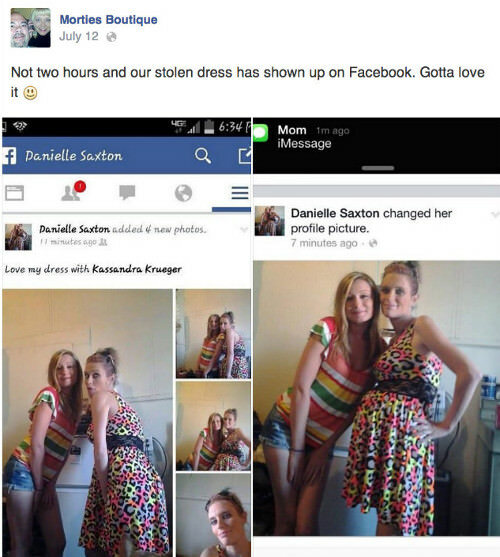 An Illinois woman, Danielle Saxton, was arrested for shoplifting jewelery and clothing after she uploaded a selfie wearing a stolen dress. If you’re a student, you probably know that phones are never allowed in the exam hall and that it can get you in some serious trouble. 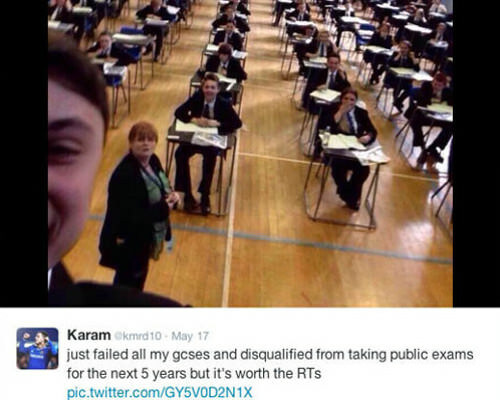 Well, this joker brought in his mobile and took this selfie just before his GCSEs. It got retweeted over 30,000 times and trended worldwide, making it a news headline. The one who caused the sensation, Karem then claimed that it was not him in the photo but instead it was someone else. Regardless of who the photo is actually of, this is a good lesson to all that you should never jeapordize your education for just a selfie. 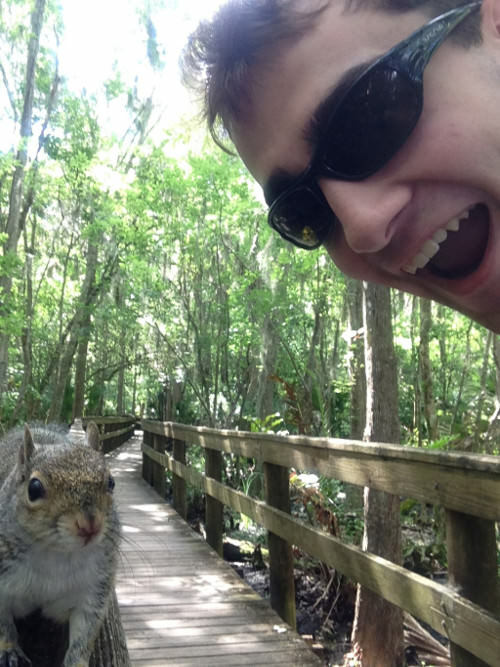 Brian Genest, 17, was walking through John Chestnut Park near Tampa, Florida when he saw the squirrel and wanted to take a selfie with it because it looked friendly. His big mistake? Using the flash. The squirrel was so startled by the flash and the noises made by his camera that it ducked for cover under his shirt. The squirrel attack left him unsettled but he wasn’t hurt. Well, at least he got a cool selfie and was even featured in the news. Here’s a seflie for a good laugh. What do you get when two girls try to take a selfie and a spider wants in on the action? A pretty epic and funny selfie.The girls were trying to shoot a video selfie when the itsy bitsy thing decided that it wanted to be famous too. This is just one of those great moments that would definitely be difficult to replicate. 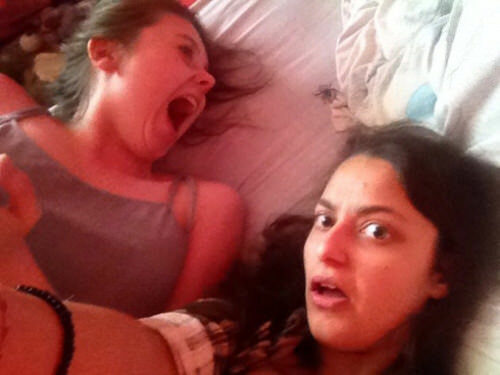 Thanks for uploading this priceless selfie, girls. There’s always a right time and place for everything. 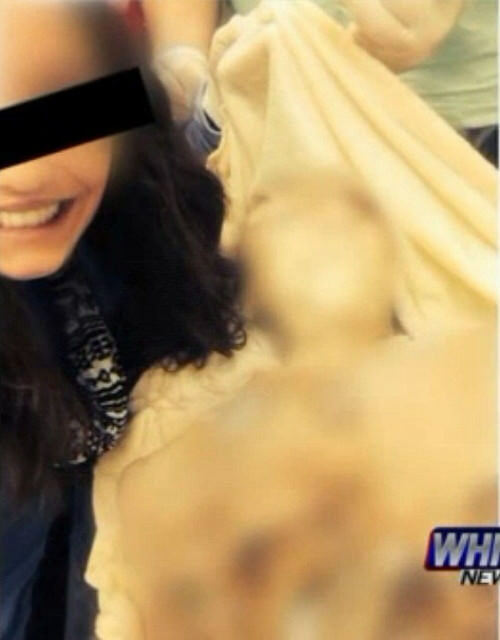 And as this girl learned, taking a selfie with a cadaver to post on her Instagram account is not one of those moments. The selfie was taken by a senior of Clements High School, Alabama during a school trip to the University of Alabama, which was held to teach pupils about an anatomical donor program. There was a rule saying that mobile phones were banned during the tour, but it failed to stop this girl from taking this selfie. Her lack of respect for the deceased is evident and it angered a lot of people. She paid the price for it though, as after she uploaded the selfie on Instagram, the school later on took disciplinary action. Jared Frank was just a regular guy who wanted a bit of fame till he got a selfie of himself being kicked in the head as train went by. One could say that he was being a bit of a daredevil as he was taking a selfie so close to the train tracks and a little bit of danger was just what he got. 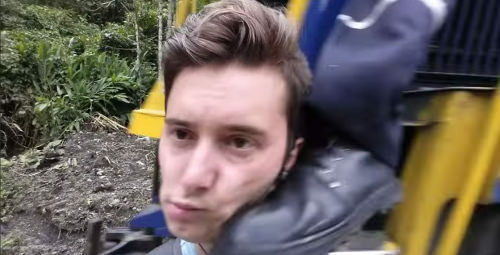 This Canadian attempted to make an epic video of himself with a slow moving train in the background but it was then shortlived when he was suddenly kicked in the head by the train conductor (accidentally, of course) on the speeding locomotive. Well, this went viral and just goes to show that you better be careful about what you ask for. 11. Hey Stranger! How About A Selfie? 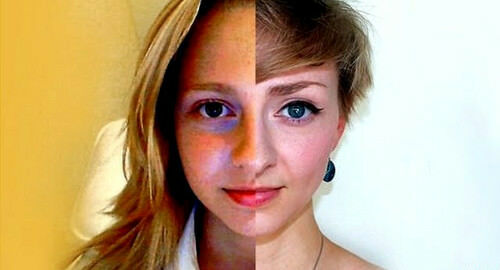 A Youtube Vlogger took over 50 selfies with complete strangers. He wanted to find a way to use the generation trend positively while walking through a mall. 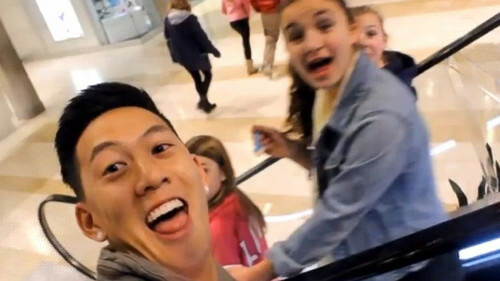 With the intention of inspiring people to overcome fears of social interaction, this Seattle-based entertainer and musician, Jason Rodjanapanyakul (a.k.a JasonSoSilly2) took over 50 ‘self-explanatory’ video selfies with whoever he met while walking around Bellevue Square Mall in Bellevue, Wash. It was met with great response and continues to entertain. It’s not just another tourist selfie. This particular selfie is touted by many as possibly ‘the best sellfie ever taken’. According to Le Thompson, the photographer and the co-founder of The Flash Pack (a travel company), this was the first selfie he had ever taken. 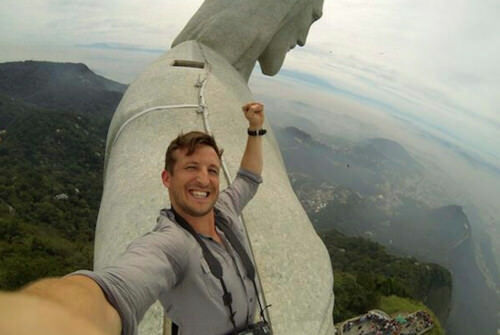 This magnificent selfie on top of Christ the Redeemer was taken after the photographer was given special privilege to climb the highest statue in the country where the World Cup was recently held this year. Most people would freak out in the case of an emergency but not this particular man. Nope. He used the opportunity to take a selfie. Fight TAP Portugal 668, en route to Amsterdam encountered an inflight emergency, due to a technical failure and was forced to divert to Paris. 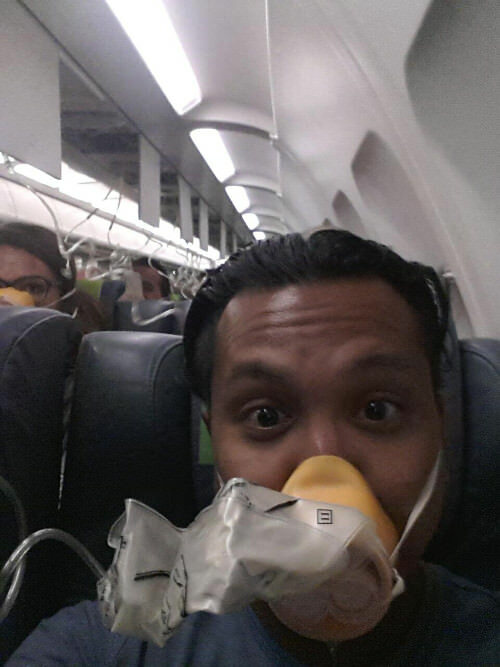 But then this man onboard decided that it was the perfect time to take a selfie, despite the intensity of the situation. One has to admire his dedication to preserving the moment though. A woman called Stacey Yepes had experienced paralysis on her left side and went to the doctor’s to seek advice. They told her that it was just stress. However, when it happened again while she was driving home, she took out her smartphone and recorded herself in video and picture and detailed her experience. 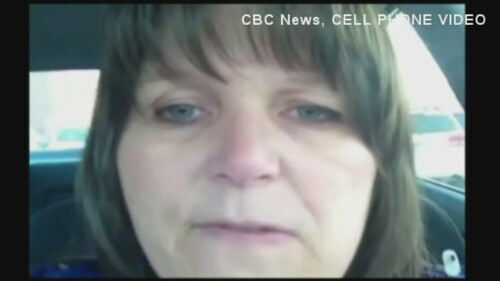 After taking a look at the evidence and further examination, doctors told her that she had indeed suffered not one but three strokes. When an amateur photographer got back his camera, he probably never expected to get an extra bonus picture of the mayor. And what’s more, a selfie too. 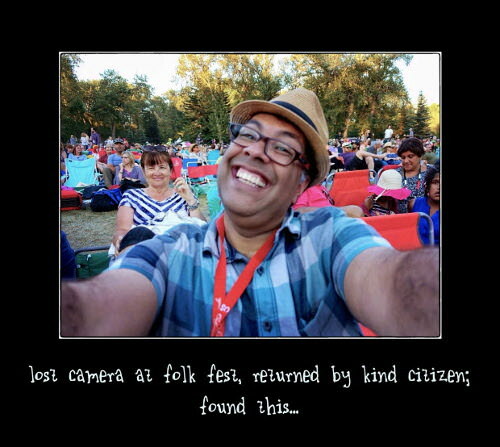 Gabriel Collins thought that his camera was gone forever when he lost the camera at a Calgary Folk Festival. But those worries didn’t last very long as he got his camera back from Mayor Naheed Nenshi. Half an hour later though as Collins was going through the photos, he found a selfie of the mayor. A good citizen always returns the belongings of others but a mayor with a sense of humor will take a selfie first.